​Eversheds has confirmed another two years of sponsorship for SportsAid’s SportsBall as a top-tier ‘Presenting Partner’ of the prestigious charity event which supports the next generation of British athletes. With a new date and venue this year, SportsAid's SportsBall is proving more popular than ever as the charity gears up for its 40th anniversary in 2016 - with Gold and Black tables already sold out. 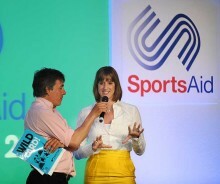 Olympic athletes Karen Pickering, Mohamed Sbihi and Steve Williams have all confirmed they will be at next month's Sports Quiz at Lord's Cricket Ground to support SportsAid. Tickets for this popular charity event are on sale now.